Scott and I are finally back from our 9 week trialing and clinic trip in the US. 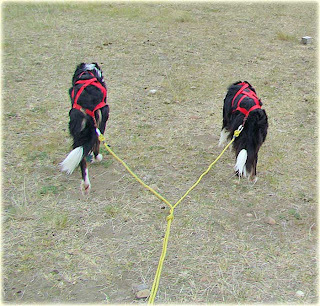 The Fetchgate nursery trial was our last competition and the rest of the time was spent at clinics. I am home for a little over a week but Scott is away teaching another clinic. 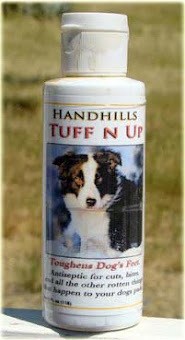 A week is not alot of time for me to fix the problems I had been seeing in my dogs but it is a good time to start. The biggest problem I saw in Lad and especially Hemp was conditioning. Hemp is all about the sprint. His whole life is lived for very short but fast movements. It's causing him to run out of steam in a trial since he puts everything into his outrun and has nothing left for the course. Scott has given me some training changes but the bottom line is that he needs to be in better shape. 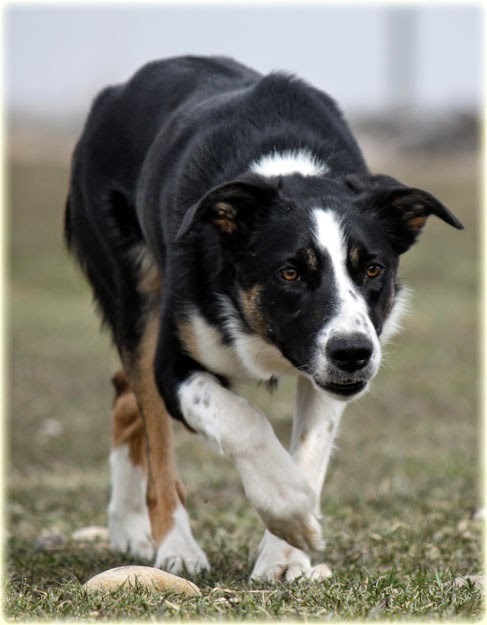 Most of the time, when I take Hemp out for a run with the quad, he sprints to the end of our field and waits for me and the other dogs to catch up. This has to stop since it is feeding into his whole problem, plus it's only getting him ready for great, fast outruns but not for continuing a long course. I started thinking of ways to get him to run with the quad. 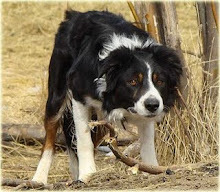 The obvious answer is to put a leash on him but I've tried that and all I get is sore arms from him dragging me along. I decided on an idea that I'd been thinking about for a long time. Why not put him in a sled dog harness and let him pull the quad? 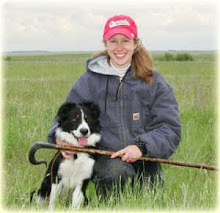 I love to read about the sport of mushing and it is my second favorite dog sport. We actually have some sledding harnesses so I rigged up a gang line and hooked them up. I'd like to say that I wasn't one of those novice sledding people who figured they'd just hook up the dogs and be off, but I'd be lying. My first attempt with Lad and Hemp was a mess. I decided to concentrate on Hemp since he is the true problem. Plus I figured that since he's a big runner, that if he got it figured out, he'd drag Lad along. I worked a week on Hemp and got him pulling into the harness pretty well. 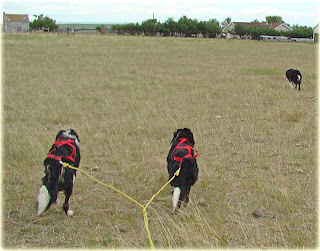 He isn't actually pulling the quad - he pulls into his harness and I control his speed with the motor on. He has some difficulty with the start but once I hooked Lad in, he picked up on the beginning part and got Hemp going. 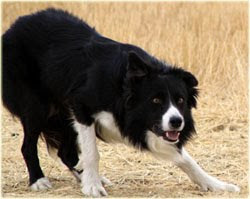 Once they are both started, Hemp does often drag Lad along, who tends to be a little lazy. Neither dog is really leaning in the harness here but they are getting it figured out. 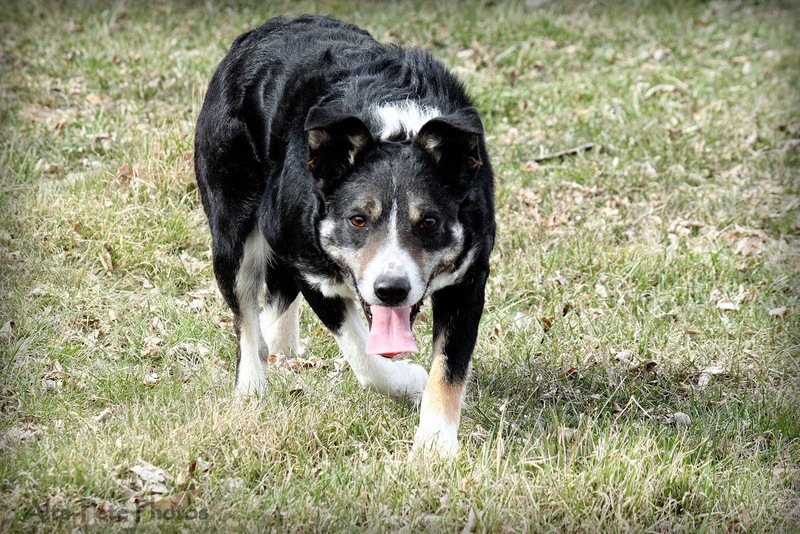 Retired dog, Jed has a good time running loose, ahead of the harnessed dogs. The only thing they are missing is a neck line that keeps them pulling evenly, but since they are still picking their sides, they will tangle if I put one on and they decide to change sides. We are still learning so the neck line will come later. 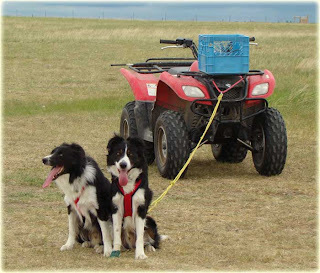 My goal is to get them out on our gravel roads (with booties since it will tear up dogs feet if they don't have them) so we can go bigger distances without having to turn around. Steering is a problem right now but the roads should not require much in the way of turning, especially when they start learning the route. It seems to be helping Hemp all around. We are still a long way from being in shape but he is definitely getting the idea of just trotting for a long distance instead of racing ahead and stopping. We have quite a few trials coming up. 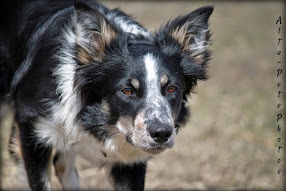 First, Hemp, Lad and I will go down to Longbranch, Washington with a couple of friends (Scott will stay behind to relax at home and tune up his dogs) to the MacDonald's Ewesful Acres trial on June 27 and 28. 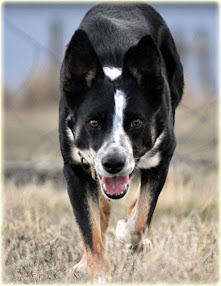 We will race back up to Alberta to make it to the One Tree Stock Dog trial(Scott will make that one too) in Brooks, Alberta on July 1 and 2 and then immediately over to Irricana, Alberta to the Hilltop trial on July 3 and 4. 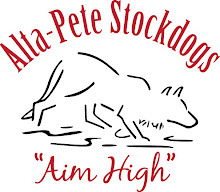 Scott will then go home with the whole dog kennel minus Lad and I, who will try our hand at the Calgary Stampede. For those who aren't familiar with it, the Stampede is a time and points arena trial that is alot of fun. First prize is $10,000. All of it goes to first place. Second place is $4,000. Worth a trip huh? 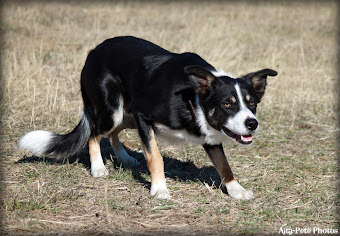 There are some very good arena trial handlers that give it a go every year so the competition is tough. 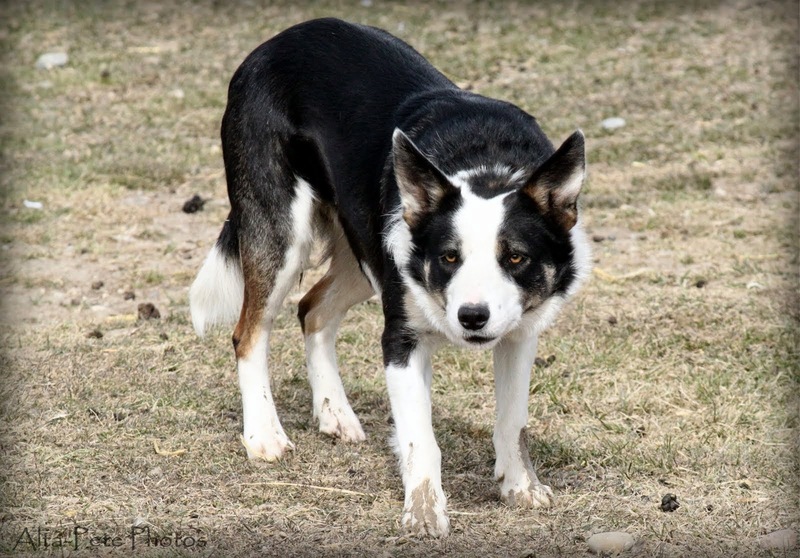 My old Bob dog and I were reserve champions in 2004 at our one and only attempt, so I thought I'd give it another go with Lad, who is his cousin. I don't have high hopes because Lad doesn't have the experience that Bob had in arenas. We tried a little course the other night and when we sped it up, Lad got excited and gripped. Twice. That is a no-no at the Stampede so we had a talk about it. 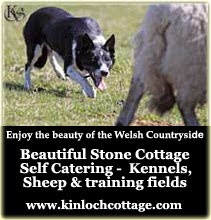 The sheep are notoriously difficult and often attack the dogs. Still no gripps are allowed. We plan on having a good time anyway even if we do get DQed for flossing with wool. Sorry, I will not be able to do updates until after all the trials are over. My laptop is not set up to work in Canada and we will be too far away from home for me to give daily updates. I promise to still get pictures and top scores. Oh, and one more thing, we've had a little change around with the nursery dogs. 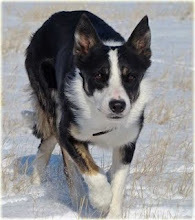 Scott has several dogs qualified for the nursery finals but since he's only allowed to run two, River and Tuque have started training with me so that I can run them. We will spend the end of June and most of July getting to know each other and we'll start trialing at the end of July at the EID Classic.